Climbing on flat Tiree? - surely not! These are the west-facing sea cliffs of Kennavara (Ceann a' Mhara) on the south-west corner of Tiree. 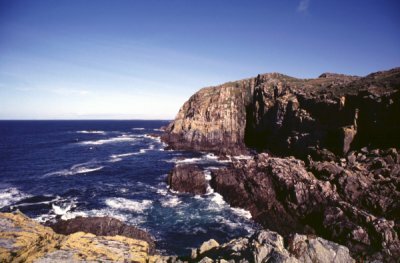 During a lull in the Tiree Wave Classic windsurfing competition in September 1993, Tiree witnessed what was probably the first ever ascent of the these cliffs by a small group of the annual incomers. The photo below is of the area of cliff in shadow just to the right of the sunlit cliff facing the camera. 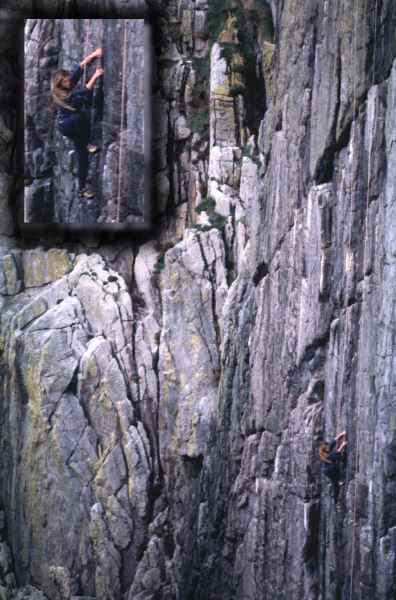 The climber is Christine Spreiter. Proof - if it were needed that homo sapien windsurferus evolved from a much more primitive form of hominid whose limbs were already strangely extended.